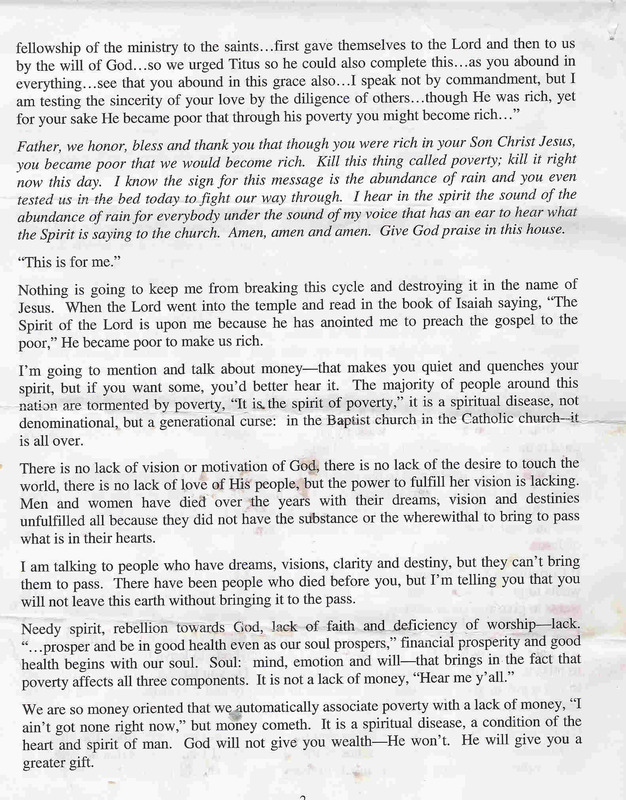 A sister in Christ named CC, who also escaped the false prosperity doctrine that is promoted by Eddie Long forwarded me a copy of a sermon Fast Eddie seemed rather proud of. According to CC and the sermon transcript, Fast Eddie was so fond of his hack of a sermon, he “preached” it on a Sunday 12/4/2005 and then had the full sermon transcript handed out to those who attended the Wednesday night service show on 12/7/2005. (So we are around the 4 year anniversary of a moment Eddie Long was rather proud of.) He wanted to make sure everyone got a copy of this one! 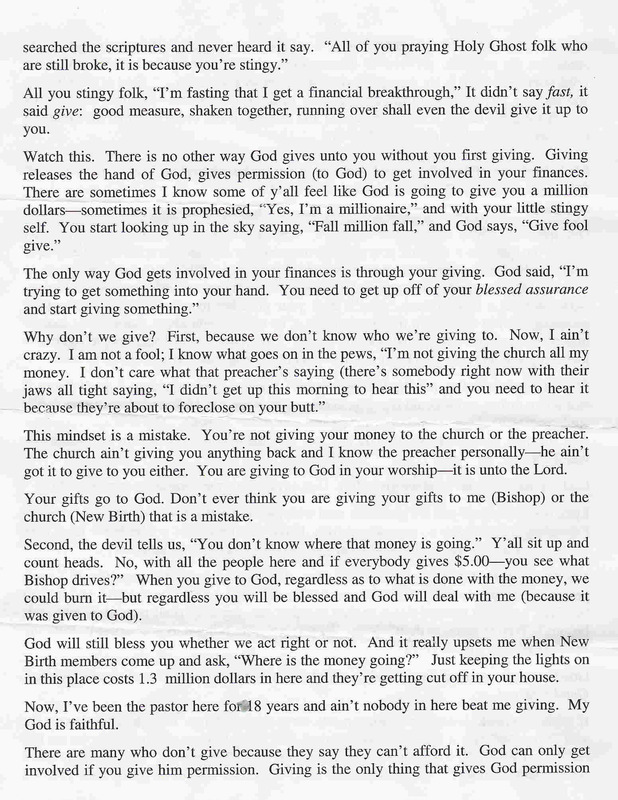 And so to show you how far deluded Eddie Long is, so that you know I’m not making it up when I warn you to avoid Eddie Long, I’ve included the full “sermon” transcript below. As CC informed me and you can see from some of the statements, this “sermon” was delivered with much attitude, an upset and angry attitude. So read it all in the links below. If you find it to be a “good” sermon, I encourage you to read the commentary further in this post, because you’re allowing a false teacher to exploit you. 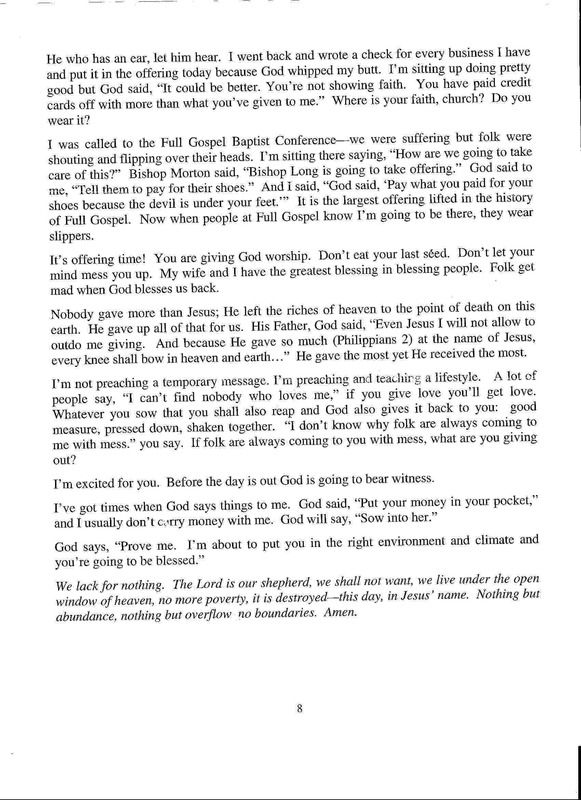 Eddie Long 12/4/2005 service transcript page 1. 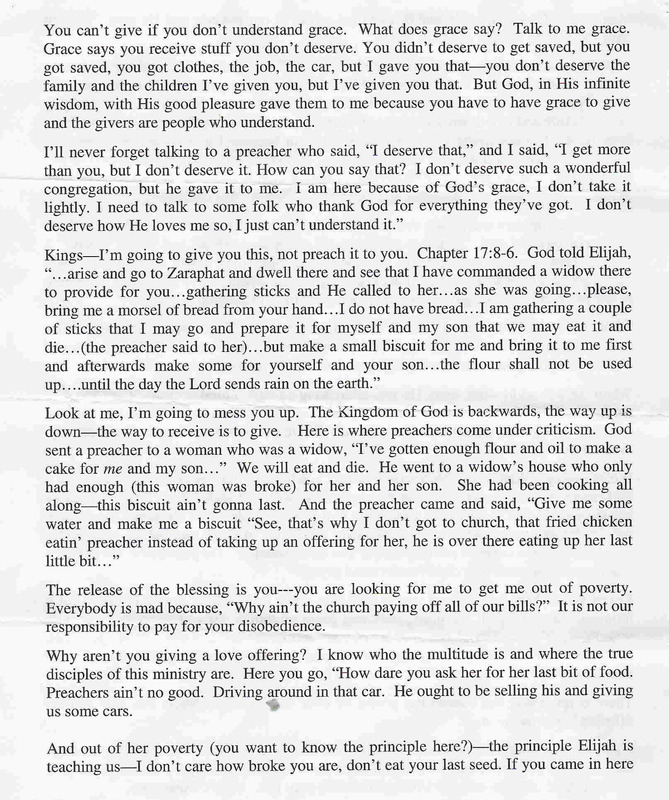 Eddie Long 12/4/2005 service transcript page 2. 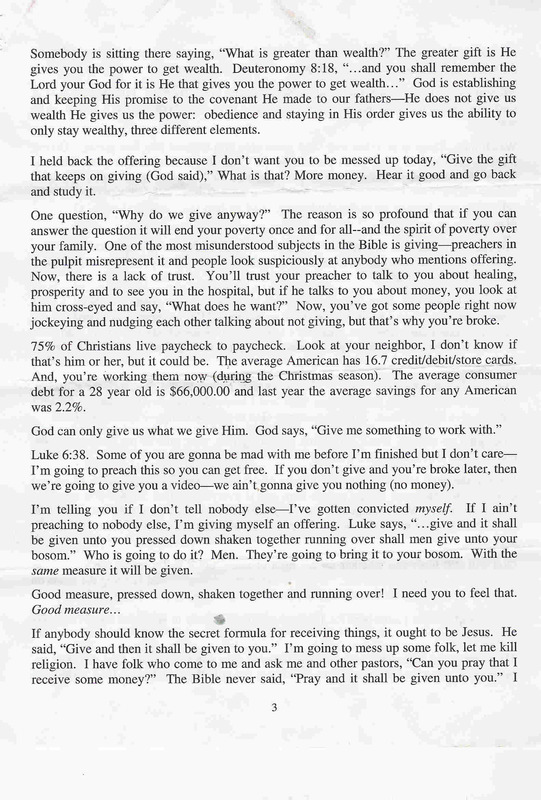 Eddie Long 12/4/2005 service transcript page 3. 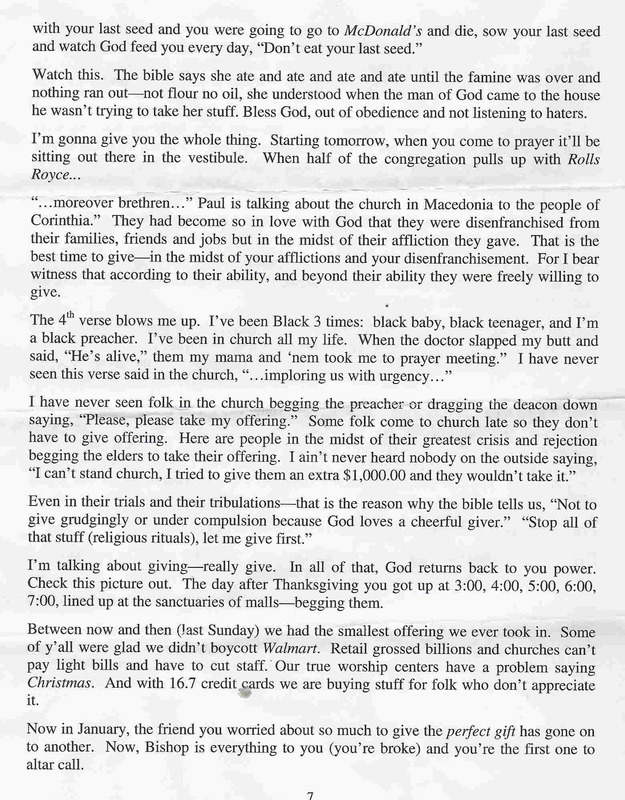 Eddie Long 12/4/2005 service transcript page 4. 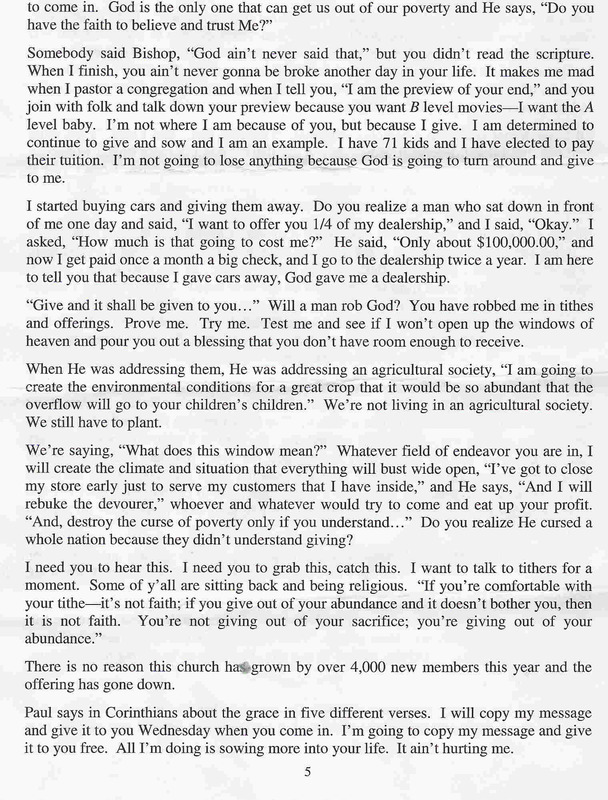 Eddie Long 12/4/2005 service transcript page 5. Eddie Long 12/4/2005 service transcript page 6. Eddie Long 12/4/2005 service transcript page 7. 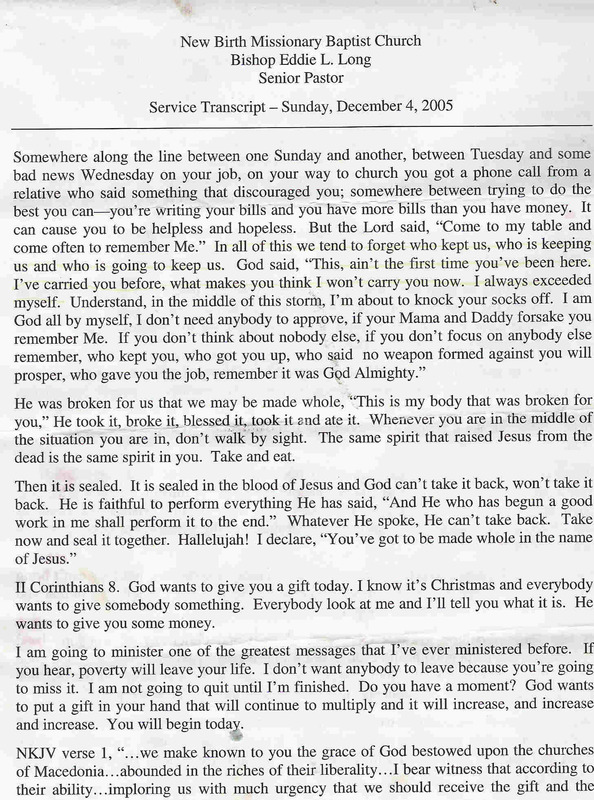 Eddie Long 12/4/2005 service transcript page 8. Now that you’ve read it, let’s review this wayward teaching and explain why it is wayward. To speak to every statement would require a book, so just certain statements will be reviewed in detail. But this “sermon” is SO BAD it’s really full of way more error than will be detailed below. He begins with talk about people trying to figure out how to pay their bills. Starting the focus from sentence #1 on MONEY. And then he uses the following to assert he has support in scripture for his feeling that God wants to give you some money. 2 Corinthians 8. God wants to give you a gift today. I know it’s Christmas and everybody wants to give somebody something. Everybody look at me and I’ll tell you what it is. He wants to give you some money. From the outset, the position is to hack a portion of a Pauline letter and claim the people listening to him can have God toss them cash like an ATM in the sky! Or as Fast Eddie plays it, access to wealth. What you’ll soon find, is that Fast Eddie skips over key verses in 2 Corinthians 8 during his “sermon”, in a manner that alters the Word of God into something heretical. God used the apostle Paul TO WARN THAT LIARS LIKE EDDIE LONG WOULD COME ALONG AND DO THIS! The apostle Paul told poor debt slaves not to consider godliness as a means of gain, but Fast Eddie is asserting that God wants to give everyone who is listening to him money. There is a direct contradiction between what the apostle Paul was speaking about regarding money and what Eddie Long is promoting. Scripture being the final authority, this makes Eddie Long a liar and one who is best avoided. Eddie continues, in speaking how he is going to break a cycle (of low money) and nothing is going to stop him from doing it. Nothing is going to keep me from breaking this cycle and destroying it in the name of Jesus. When the Lord went into the temple and read in the book of Isaiah saying, “The Spirit of the Lord is upon me because he has anointed me to preach the gospel to the poor,” He became poor to make us rich. I’m going to mention and talk about money-that makes you quiet and quenches your spirit, but if you want some, you’d better hear it. The majority of people around this nation are tormented by poverty, “It is the spirit of poverty,” it is a spiritual disease, not denominational, but generational curse: in the Baptist church in the Catholic church–it is all over. Notice Eddie speaks about how he will break the cycle and nothing will stop him. Very self centered. Then he tacks on “the name of Jesus”, to give the appearance he’s acting for good. He’s lost the truth of Christ becoming poor for us to be rich. Eddie Long has made “gospel” synonymous with “money”. Jesus did not die on a cross for us to have some money, the Apostles remained hungry and homeless, 1 Corinthians 4:11. Again we see Eddie Long is preaching another gospel. Jesus warned against going after riches of this world and spoke of giving something better than money. Eddie Long speaks of listening to him to get some money, while THE LORD JESUS CHRIST said don’t work for the food of this life, but work for the great gift He gives, eternal life. It should be obvious to those with ears to hear, that Eddie Long’s message is an antichrist message. The name “Jesus” is used as a prop, while the real worship is of money. Eddie claims poverty is a spirit. So since the Apostles and Christ were hungry and homeless, Fast Eddie’s view leaves Christ and the Apostles looking like they were dominated by an evil spirit! Also notice how Eddie Long speaks of Baptists and Roman Catholics in the same sentence, as if both are promoting the truth. Ignoring Roman Catholicism promotes false worship and acting like all everybody needs is some money. Eddie then goes on to totally mangle Luke 6:38 and act as if it is the blueprint for material riches. Because while acting like saints should be focused on “the power to get wealth” in a material sense, his deluded mind can’t properly read scripture. But lets read that passage of scripture in full context, with some of the preceding verses, to ensure we clearly see what Jesus was talking about in verse 38. 29 “Whoever hits you on the cheek, offer him the other also; and whoever takes away your coat, do not withhold your shirt from him either. 30 “Give to everyone who asks of you, and whoever takes away what is yours, do not demand it back. 31 “Treat others the same way you want them to treat you. 32 “If you love those who love you, what credit is that to you? For even sinners love those who love them. 33 “If you do good to those who do good to you, what credit is that to you? For even sinners do the same. 34 “If you lend to those from whom you expect to receive, what credit is that to you? Even sinners lend to sinners in order to receive back the same amount. 35 “But love your enemies, and do good, and lend, expecting nothing in return; and your reward will be great, and you will be sons of the Most High; for He Himself is kind to ungrateful and evil men. 36 “Be merciful, just as your Father is merciful. Notice, verse 38 when read with the preceding verses is not about giving Eddie Long money. It’s not about giving any pastor money or even the chruch money in this particular verse. (Certainly we should give to a good church, but that’s not what this passage is about.) As verse 30 brings things into proper context, it’s about giving to everyone who ask and verse 27 plus the latter portion of verse 30 makes it more focused on being able to calmly endure when enemies take what is yours. This is a passage of scripture most saints spend a lifetime trying to carry out properly. But it’s certainly not about being an Eddie Long fanatic and giving him money with the assumption it will make you rich. Also, before verse 38, verse 37 speaks about not passing judgment and condemnation, giving pardons. So verse 38 is certainly not focused on money. Meaning, the return for doing as Jesus commanded and helping enemies, is a multiple in return of the kindness you show to people who are not already your friends. Notice, Eddie Long’s view of things is totally incompatible with what the verses are actually saying. This further proves not only that Eddie Long peddles a false gospel, but that listeners have to be doing home study, to ensure they won’t be misled. Ultimately, one has to pray that God guides them properly via the Holy Spirit when reading the Word of God, so you don’t misread like Fast Eddie. Because only by God’s grace will you get it right! Eddie had already mentioned earlier that the offering had been held back so he could speak this. To ensure maximum funds in the offering plate. This is known as preaching the money out of people’s pockets. Playing on emotions, to try and up the take in the collection plate. As in no money if you’re in need. Now look back up at Luke 6:27-38 and see how Eddie further proves he’s preaching another gospel, not the Gospel of the Lord Jesus. If I ain’t preaching to nobody else, I’m giving myself an offering. Given his lies, it’s a shame anyone else gave him anything. Notice he’s focused on himself. Giving releases the hand of God, gives permission (to God) to get involved in your finances. We who are saved, simply responded to work God performed, He pricked our hearts, despite our own prior unwillingness to embrace Him, Romans 3:9-18. And we don’t get anything in a material sense based off doing some work that grants God “permission”. All is as the Lord wills for HIS OWN good pleasure! It is THE LORD who wills, not man. It is the Lord who reigns, no man has God on a leash like some earthly dog! It is God who permits, God who saves, God who gives, God who rules. I would recommend anyone holding onto Arminianism aka “Free Will” doctrine, seriously consider giving it up and instead fully acknowledge the sovereignty of God in the affairs of otherwise fully depraved man. I mean, you know I’ve already told you the deal, but I’m just amazed at how politicians continue to DUPE CHRISTIANS. Because I’m SURE in November 2012 I’ll again be hearing how much of a “Christian” Obama is. So put this into your time capsule and open it in 2012. I don’t know how long that picture will remain online, but it’s a photo of our President Obama in the White House lighting a Diwali candle with Hindu priest Narayanachar Digalakote. You don’t know what Diwali is? Well it’s an Eastern Pagan celebration of the “light” within “you”. You can read about it at this web site and be sure to see this page. If I’m a Christian who knows Jesus is the Light and I am totally in darkness without Him, why would I light candles in a celebration that claims light via another source? 2 Corinthians 6 teaches Christians not to be bound with unbelievers and I know the “light” Paul wrote about was not Diwali. But hey, for you who still feel Bush did everything better, you might want to read this and see who started the practice of Diwali celebrations at the White House. Bush started it and although he didn’t participate in lighting a candle, he left members of his administration to “grace the occasion”. Bush started and Obama has carried the ball even more yards. I’m learning the term “Christian President” is an oxymoron. You never hear what the false prophets don’t say when they deliver their prophecies. However, I have stumbled upon a technology which can fill in the subliminal parts of their messages. Here are some of the results. The missing parts that I was able to fill in are in parentheses. “There will also be some new wonders coming to the church. (People will wonder how we false prophets get away with our deception so easily. )Â We had some of these just recently where (the super false prophet) Bob Jones and I (a major false prophet) (never) heard angels singing twice in a meeting. This didn’t even take any faith, it was so loud and so clear (and so non-existent), it was like a choir (not) singing. Another time, we had the odor of incense fill a meeting for about 15 minutes (then we blew out the scented candles).Â It was so intense that you couldn’t help but smell it (was cinnamon) …He (never) gave it as a witness that He was receiving the intercession from these people, the prayers and their intercession. He had said He would (not) come with a sign that we would smell the (phony) incense. It came so powerfully faith was hardly needed (However, group hypnosis was essential.). And we saw the wind of the Spirit blow so hard at a meeting you could see people’s hair blowing! (Then we turned off the fans. )Â So He is (not) coming (to any meetings) a whole lot more dramatically (because His Word says it will be as the lightning flashes from the east to the west). As one brother said, ‘This hardly takes any faith (just extreme suggestibility), it is so (not) obvious.’ But when He comes in ways like that, it is always to give a message (that this manifestation is false). He is not just trying to tickle our curiosity or our interest in (false) supernatural things, He is (not) trying to say something to us (because He has finally spoken to us by His Son through the original apostles). “I know deep in my soul something supernatural is (not) going to happen in Nairobi Kenya. Paul and Jan are coming to Nairobi with me (to help spread error, a different spirit and another Jesus with their vast network), but Paul, we may very well (not) come back with footage of Jesus appearing on the platform. You know that the Lord (never) appeared in Romania recently and there’s a (fake) video of it, where (something other than) the Lord appeared in there back of a church and youÂ see Him on video walking down the aisle, Yea. Paul do you remember when I came on TBN years ago I showed you a (phony) clip of the Lord appearing in our church in Orlando on the balcony on the wall? Yea you remember that. Well, you can see that this technology is really just old-fashioned satire. It is effective in exposing the sandy foundation of error. It is open source and freely available to any discerning believer who can rightly divide the word of God. These people above and all their comrades-in-arms are dangerous wolves who have no godly principles. They do not honor the Word except to appropriate it to give their deceiving words the illusion of credibility. It works with the unlearned, the unsuspecting and the false brethren. Beware them and their ilk. Do not support them in any way.Â Â Do not receive their messages. Especially, dear saints of God, do not inquire of them, for read what God says to us about doing that, “the punishment of the prophet shall be the same as the punishment of the one who inquired” (Ezekiel 14:10b) Repent of all entanglements with them lest you be swept away with them in their error. In Case You Didn’t Already Know, Kanye West Is Not A Christian. A Christian is one that has come to the understanding, that Jesus is the Only Way to the Father, the ONLY hope one has for salvation. But as my brother Speaking Truth has noted, there’s a reason I must mention trash rapper Kanye West here. Remember when almost every urban youth pastor in America embraced Kanye Westâ€™s song â€œJesus Walksâ€ as a method for evangelizing to the youth? They argued that Kanye would bring kids into the church by making Jesus â€œrelevantâ€ to their everyday circumstances. Well the kids came, but they wanted to be entertained – just like their parents. Oh, and the Gospel message never resonated with them either. For months now, Iâ€™ve been railing against the dangers of â€œrelevantâ€ and â€œseeker sensitiveâ€ church movements because they focus more on the packaging of the Gospel message than the Gospel itself. 13 wild waves of the sea, casting up their own shame like foam; wandering stars, for whom the black darkness has been reserved forever. So, although it is a bit trashy, read the interview Kanye West did with an entertainment web site recently. Specifically the parts where he is asked “We recently saw your quote â€œI donâ€™t believe in religion, and I donâ€™t believe in giving it all up to Jesus.â€ Does this mean that youâ€™re no longer a Christian? “ And “So do you believe in Jesus at all? “ Keeping in mind Jesus is the ONLY means for salvation and those who deny it are devoid of the truth. This should be a lesson of hindsight for the church. And to know that it is time to STOP making the same mistake. Those who don’t really stand on the truth should not be leveraged by the church in efforts to play marketing gimmicks like the world. The church should NOT be about ear tickling marketing gimmicks AT ALL. Stop chasing the ear tickling tunes, stop trying to take on the methods and ways of the world. Stand on The Rock of offense alone (Romans 9:33) and leave those who dislike it for God to judge.